Note: My Patreon supporters got this article early and an option to hear it in audio form. Find out how to support me on Pateron. Luca Redwood is a UK-based game developer who in 2012 scored a mobile game hit with an awkwardly named match 3 role-playing game, 10000000. Recently he released its sequel, You Must Build a Boat (iOS, Android, Steam). 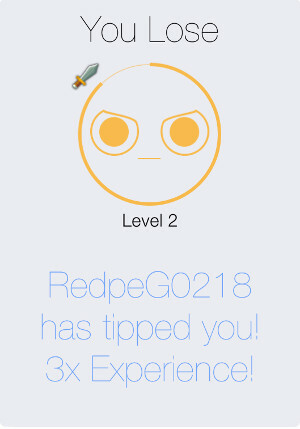 Between those two games, though, Redwood released a peculiar dueling game called Smarter Than You (iOS). It’s like rock paper scissors in that sword beats arrow, arrow beats counter, and counter beats sword. But you can also bluff before each attack by using a menu of words to build sentences. You could say “Arrow looks like a good choice,” but you don’t have to take your own advice. You could hope to throw your opponent off and choose counter instead. But what really interests me about Smarter Than You is what happens at the end of a match: you can give your opponent a tip. The game features an experience point and leveling system, which unlocks cosmetic options. Besides winning matches, you can also receive experience as a gift from an opponent. But here’s the weird part: Tips were originally done only through in-app purchases. After a match, a little slot machine wheel would spin and you randomly got the option of paying either $1, $2, or $3 to give your opponent some bonus experience points. You could choose not to tip at all, but if you did tip it cost YOU real money to give THEM bonus experience points and YOU got nothing out of it but warm fuzzies. Well, in actuality it’s beyond “very small” if millions of games were played. It’s essentially 0.00% after you round off. So Redwood added a fourth possible outcome to the slot machine reel: watch an ad. 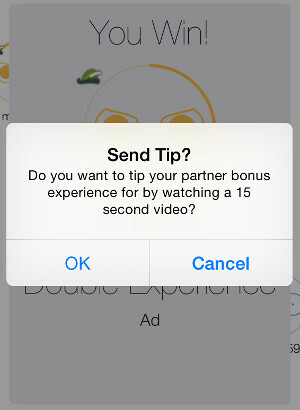 If you get that option and choose it, you watch an advertisement, and your opponent gets the benefit. What’s more, they don’t even know if you watched an ad or paid real money. This worked out much better for everyone involved: according to Redwood, the percentage of tippers went from 0.00% to 60%. That’s a huge increase –far more than you would expect from a linear relationship between cost and benefit. So instead of paying real money for virtual currency or some other in-game benefit, any player could now watch a video that some advertiser paid Redwood to put in. It was like the players are being paid for their attention. A bargain either way, but most people (64%) chose to pay $8 for the $20 gift card because it netted them $12 in credit ($20 minus $8) whereas the other option only got them $9. For a group of completely rational humans, this should have changed nothing. Because the price of each option had changed the same amount, the ratio of cost to value was unchanged and the $20 card was still the better value. But we evaluate “free” according to different rules than other prices, so every single person (100%) in the study took the free gift card even though it netted them less Amazon credit. The results were pretty clear: up to 90% of shoppers helped themselves to the plastic bags at stores where the fee hadn’t yet been implemented, but that dropped to 40% at stores where the bags cost a mere 2.5 cents. Again, the preference for “free” was disproportionate and alluring. If the Shampanier, Mazar, and Ariely study is any indication, most people in Group A will spend 15 diamonds to award 1,000 points, but most people in Group B will be irrational and elect to watch the ad. But what would be interesting to find out is if the options in Group B generated more tipping (and more revenue) overall because of those choices. 1. Shampanier, K., Mazar, N., & Ariely, D. (2007). Zero as a Special Price: The True Value of Free Products. Marketing Science, 26(6), 742–757. 2. Jakovcevic, A., Steg, L., Mazzeo, N., Caballero, R., Franco, P., Putrino, N., & Favara, J. (2014). Charges for Plastic Bags: Motivational and Behavioral Effects. Journal of Environmental Psychology, 40, 372–380. Really nice article, but I think I don’t understand well the studies’ choices. In my opinion, the “cheapest” option is always the one with the highest benefit. For the amazon gifts: the 20$ gift card requires that you give 40% of the amount and only 10% for the 10$ card (so, personally, I’ll choose the 10$). In the case of the game diamonds, I would have to chose between giving 15 times 100 diamonds (1,500) or once 1,000… I guess my choice here is also clear. Do I understand something wrong? That’s an interesting way of framing the decision. I think most people, though, just look at it as the standard Pick the one with the highest “benefit minus cost” assuming that they have enough money to make the transaction. My first instinct was also to get the 10% investment on that Amazon card. I’m not quite sure why. Maybe I evaluated the type of choice as if I could do it over and over again instead of the specific instance of choice as if I could do it only once. In the Amazon Gift card example, the best option to maximize your personal benefit (assuming this is a one-time deal) is to buy the more expensive card, and gain a $12 or $13 benefit. In the “Smarter Than You” diamonds example, the best option to maximize your personal benefit is in both cases “Don’t tip at all”. At least, that maximizes your pecuniary benefit. If we accept that there are beneficial warm fuzzy feelings to be had by tipping, then the best option to maximize this is the one that costs least and still provides those “warm fuzzies”. That would be either the 1 diamond option or the ad-watching option. The other option may provide more benefit to the recipient, but not necessarily to you, the donor. But the source of the warm fuzzies is the imagination of being on the recipient end, thus 1000 XP should net larger fuzzies.